In Timor-Leste, forests areas had declined from 1,053,000 ha to 869,000 ha from 2003 to 2012. During the same period, a total of 151,000 ha of dense forests had been converted to sparse forests or non-forest land. If this tendency continues, the total forest area would be further reduced by 17 % and dense forests be halved in 2023, affecting the life of the people in the country. To combat this situation, the Government of Timor-Leste enacted Forest Law in 2017. 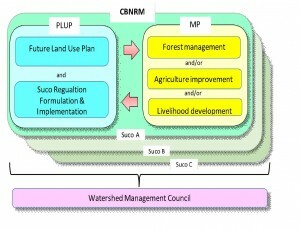 It stipulates that “sustainable community forestry management is prioritized for sustainable forest management (Article 6)” and “the state recognizes traditional rights over forest resources (Article 7 of the law).” Based on this recognition, MAF has been promoting the CBNRM mechanism as the major tool for protection of forests. 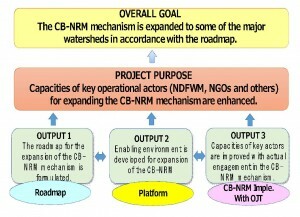 What is the CBNRM mechanism? The CB-NRM mechanism is an integrated approach to sustainable forest management at village level. It consists of Participatory Land Use Planning (PLUP) and Micro Programs (MPs). In PLUP, communities develop a future land use plan as well as village regulations that indicate activities and behaviors to be allowed / not allowed for community management. PLUP is then followed by MPs, which are forestry and agricultural extension services, helping communities realize their future land use plan by the village regulations. 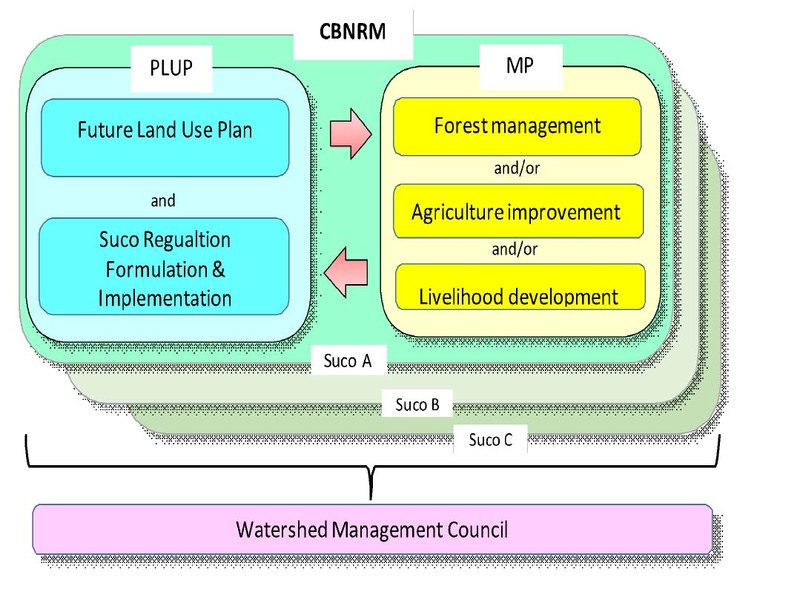 While the CBNRM mechanism is for resource management at village level, it can be integrated into watershed management. With villages having established CBNRM, a local watershed management council will be formed. The council is to facilitate knowledge sharing among villages concerned with a particular watershed area and coordinates issues at inter-village or (sub-) watershed level. MAF has been implementing CBNRM Projects in collaboration with Japan International Cooperation Agency (JICA). The Project Phase I (2010-2015) has successfully demonstrated how to introduce CBNRM into a village, targeting 6 villages in Aileu Municipality, while piloting the establishment of a local watershed management council as a coordination body, which is Noru Watershed Management Council. Based on the experience of Phase I, the Project Phase II has been implemented since August 2016. Phase II has three outputs (i.e. 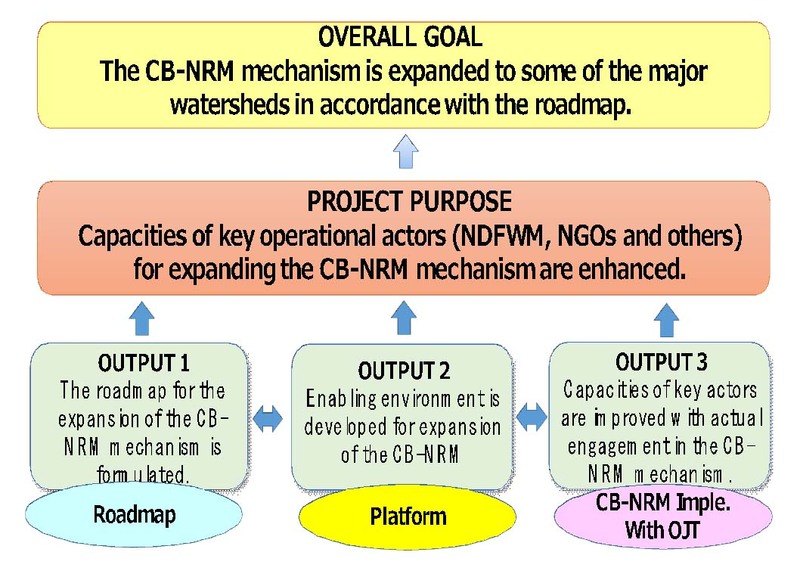 CBNRM Roadmap, Platform, Implementation with On-the-Job Training (OJT)) to achieve its ultimate goal, which is to expand CBNRM, through collaboration with Development Partners (DPs) and NGOs, over critical watersheds in Timor-Leste. In fact, the introduction of CBNRM to villages are being undertaken with joint efforts of various DPs/ projects (e.g. FAO, GCCA-Camoes, GCCA-GIZ, UNDP, USAID-Avansa, and UNDP) and international/national NGOs (incl. RAEBIA, Halarae, Permatil, Fraterna, AHCAE, Fraterna, IMI, Malaedoi, Maharu, CVTL, Conservation International, CIACS, HADEER, Prospek and OHM).